If you have twins, you know that getting all of the equipment you need can be a double headache! Choosing the right twin beds is no exception. There are lots of options out there including daybeds, pullout beds, and bunk beds. Some things to consider before you begin your search: Do you want to be able use the bed in a guest room or den once your kids outgrow it, as you can with a daybed? 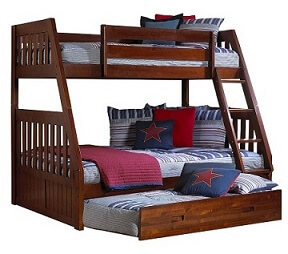 Do you want the option of separating bunk beds into two separate twin beds? What are the dimensions of the room where the bed is going? How important are special features such as storage drawers or roll out desks? Are your kids old enough to be in a bunkbed? To get you started, here is a list of some of the most popular models on the market, including a rundown of their basic features and dimensions. Keep in mind that regardless of which twin beds you order, you will need to look separately for the mattress. None of the models reviewed here come with a mattress. This model comes in espresso finish and fits a 7-inch mattress. For a more sophisticated look, this twin daybed with a pullout twin bed can add an easy elegance to other rooms in the house if your twins outgrow it. One thing to note is that the pullout bed does not rise. 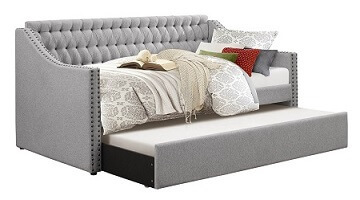 This daybed comes in gray and can fit up to 8" thick mattress. 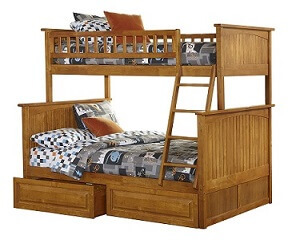 This sturdy twin bunk bed can be converted into two separate twin beds, which offers versatility as kids get older. It’s also made from solid wood. However, it does not feature any extra storage space. This model is made of environmentally-friendly solid rubber wood and is available in multiple non-toxic finishes. If space is an issue, you can’t go wrong with these sleek, compact twin bunk beds. 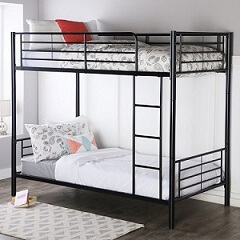 With safety guardrails for the top bunk and a ladder that can be attached to either end, these bunk beds can also be separated in two twin beds. These beds are made of steel with a powder coat finish and come in black, silver, and white. If you want to maximize your sleeping options, this model includes space for three mattresses – a twin on top, a full on the bottom, and a twin for the pullout bed. Alternatively, the trundle area can be used as a big storage unit. The entire unit is made of solid wood and comes in several colors. 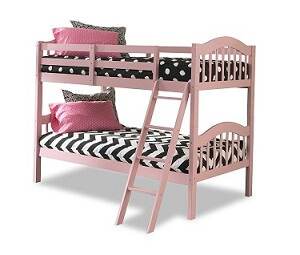 This attractive bunk bed easily converts into two twin beds. The ladder can be set up at either end, and the unit also includes storage drawers. This model is made of eco-friendly hardwood with a protective finish and fits up to 9.5 inch mattresses. It comes in white and caramel. 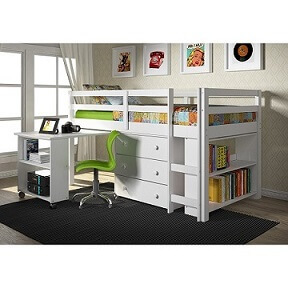 This unique all-in-one kid's space is made of solid pine and includes three storage drawers, a bookshelf, and a roll-out desk underneath the twin bed. However, as it only has room for a single bed, you would have to purchase one for each child. This model is made of solid pine offered in a range of finishes. These are just seven of our favorite twin beds on the market. Check out some of the other top-selling twin beds and bunk beds.